“Location, location and location” is an enduring cliché in the real estate industry because it’s true. The backers of Downsview’s planned University Heights Professional and Medical Centre hope that real estate mantra will pay off with quick occupancy for its eight-storey building, which is anticipated to be ready for owners and tenants in June 2016. It shares its auspicious date with the proposed unwrapping of the Toronto Transit Commission’s new Finch West Station subway, currently a series of large excavations at the southeast corner of York University’s main campus. An LRT station is also scheduled to be built by 2020, creating a busy transit hub. 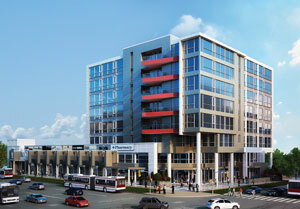 Besides the new subway-LRT station, University Heights is situated close to the newly created Humber River Regional Hospital. “This new super-hospital, the largest in Canada, is going to be attracting a lot of medical professionals from all over the place because of some of the technology that they have there exclusively,” said Paolo Abate, president of the new development and co-owner of the project. Officially, Humber River describes itself as “one of Canada’s largest regional acute care hospitals” serving a catchment area of more than 850,000 people in the northwest GTA with three sites, 3,000 staff, 549 beds, approximately 700 physicians and 400 volunteers. The facility is also going to be a training site for University of Toronto and Queen’s University medical students. Abate’s development team had not intended to erect a medical building on the one-acre site of a Tim Hortons and Shell gas station that was purchased in 2011. Fortunately for the developer, as it turned out, it took time to negotiate and close the sale and to remediate the property given its gas station roots. By that time, the current opportunity took shape. “After meeting with the city and speaking with their planners, we realized that there was a bigger initiative that could work here,” he said. Deciding to target medical users for the new building also came out of early discussions with administrative staff of Humber River Hospital. The developers of the 165,000-square-foot building are selling the medical offices as condos, supplemented by lease agreements. “Some of the more sophisticated investors who understand the space have jumped on the opportunity and purchased units because office condos are pretty rare in Canada,” said Abate. University Heights will contain 89 customizable, divisible and expandable office units of between 550 sq. ft. to more than 2,500 sq. ft. The building is being built to Toronto Green Standard Tier 2 qualifications, equivalent to about LEED Silver standards with the inclusion of high-reflecting materials, energy efficient controls, and low impact mechanical fixtures and a 7,100-sq.-ft. green roof. The new building will contain retail space on its first two floors, “an open and sun-lit commercial concourse dedicated to restaurant and retail tenants,” with professional and medical offices on the upper levels. University Heights is currently in development with an expected opening in the summer of 2016. Real Wealth Group is also currently in early-stage development in Aurora, Ont., of a multi-building commercial project that will include a medical office building, he said. As well, the developer has acquired chunks of land on Sheppard across from Bayview Village to build an 80,000-sq.-ft., eight-storey condo building that will comprise about 75 condos and retail at grade.